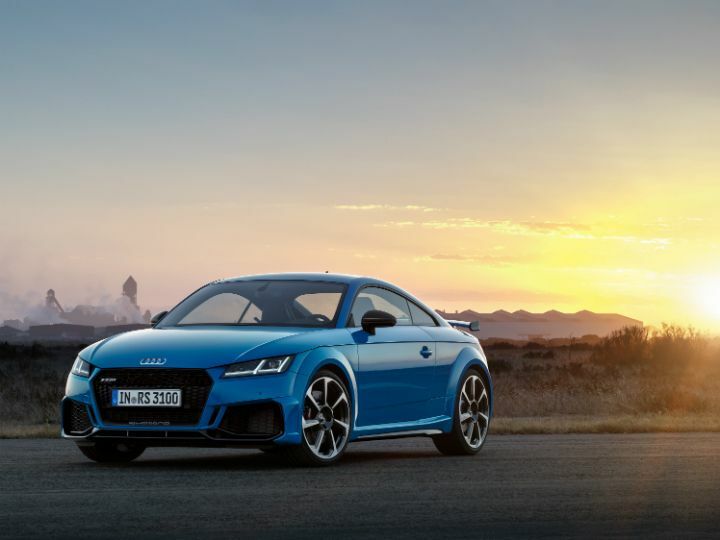 2019 Audi TT RS looks sportier than the before, if you can spot the differences. 400PS/480Nm, 5-cylinder turbocharged petrol motor remains unchanged, as do the 7-speed dual-clutch transmission and quattro AWD drivetrain. Extra radiators have been added behind the large front air intakes for better cooling, and that’s all the mechanical changes there are. Straight line acceleration is still a forte, with 0-100kmph time of 3.7 seconds, engine and exhaust tuned to create drama. The 2019 Audi TT RS is an example of how most companies deal with the ‘if it ain’t broke, don’t fix it’ situation while also keeping people interested in their products. Add some nip-and-tucks here, some eye-catching details there and voila! You have a ‘new’ product with a slightly higher price tag. Here’s a look at what the Audi TT RS Coupe and Roadster are all about. The Audi TT RS’ front bumper is more aggressive now. The side intakes push further out than before, creating that ‘wide’ look. These larger intakes are functional too, feeding new radiators which keep the drivetrain cool. Looks more purposeful with new end plates. Doesn’t seem to have any effect on aerodynamics, because performance numbers have not changed. No longer simple-looking, thanks to the addition of exhaust vents (we do not know if they are functional). Slightly more inboard than the pre-facelift model, surrounded by a more aggressive looking diffuser. New accents on the inside of the good looking A/C vents, seats, centre console, floor mats and seatbelts. The raunchy sounding 2.5-litre, 5-cylinder, turbocharged TFSI motor remains as is. It continues to develop 400PS of maximum power and 480Nm of peak torque from as low as 1950rpm. Paired to a 7-speed dual-clutch transmission and the company’s proprietary quattro AWD system, the Coupe does 0-100kmph in 3.7 seconds, while the Roadster does it in 3.9 seconds. The Audi TT range is not on sale officially in India, for now. Would you be interested in a 2-door, 2+2 sport coupe/convertible which will most probably cost over Rs 1 Crore? Share your experiences with TT 2019?